Description: A crew painted about half of this engine today. This is near Honea Path at the end of the line. Description: Gotta love the paint job on this old beauty! Title: Northbound with a visitor. Title: Under the highway north of Belton. Title: Stopping at the new Cheddar Yard for a little work. Description: Once Pickens drops off its loads for them, the Greenville & Western crew will take them to Pelzer at their interchange with CSX. NOTE: Mr. Schimm doing his signature point at the camera while behind the controls of this GP9! Description: As luck would have it, I found a good angle but fudged the exposure.. Title: Going under the highway north of Belton. Title: Slowing to flag ONeal Street. 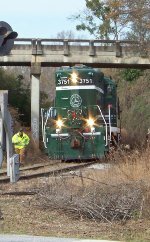 Title: The 2010 Greenville & Western Santa train, taking Santa through the Belton Jct. yard on the way to Belton. Title: The 2010 Greenville & Western Santa train, nearing Belton. Title: The 2010 Greenville & Western Santa train, arriving at the ONeal Street crossing in Belton. Description: Looking down the right side of GRLW 3751. Description: Shoving back toward the switch. This photo was taken from their caboose. Description: Shoving back to couple to the caboose. Description: A close view of the Belton Yard. Description: Shoving back to couple to caboose! Description: 3751 had a fire in the electric system and is sitting in the engine house being rewired. 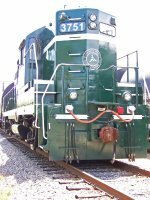 Description: EMD GP9 Greenville & Western 3751 sits in the yard at Belton on a Sunday morning. The day before, the 3751 and 3752 were pulling a Santa Train through Belton, and still have Christmas wreaths at each end of the locomotives.